On the day of two new exhibition openings, 26 June, MOCAK will also host events connected with Ryszard Krynicki’s jubilee RK’70. This outstanding Polish poet, translator and publisher celebrates his 70th birthday this year, which is why on 26 June, 5 pm, we invite you to join us at MOCAK’s arcades and participate in the discussion panel Among Books. Krynicki is not only a poet but also a bibliophile, an expert book collector, he designs poetry book covers and runs his own publishing business. The discussion on book-related passions will offer an opportunity to discover the poet’s less known hobbies. Ryszard Krynicki, Piotr Piotrowski and Masza Potocka will participate in the panel. 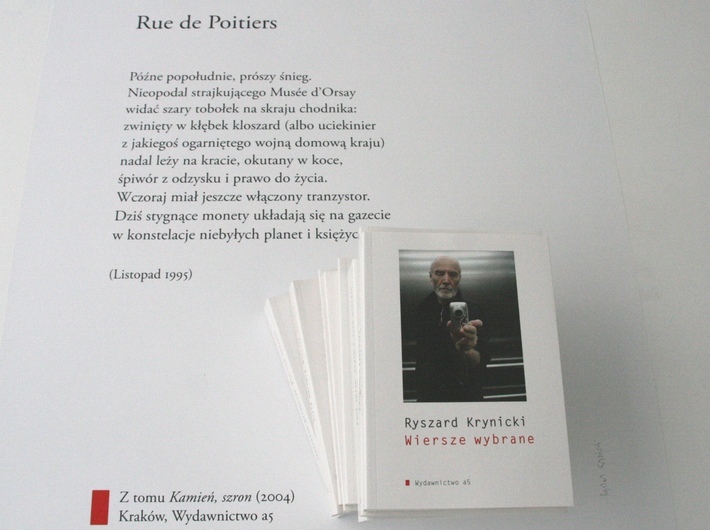 The event will be accompanied by the Posters – Poems exhibition presenting poetic posters created by Ryszard Krynicki. He calls them ‘museums of poems’. Arranged by the author himself, they will create his personal anthology. The exhibition will be open from 26 June to 31 August 2013 at the MOCAK Library. Afterwards, between 7.30–9 pm, we invite you to the concert by Pablopavo i Ludziki with the participation of special guests: Marcin Baran, Wojciech Bonowicz, Andrzej Sosnowski and Grzegorz Turnau, who will (melo)declaim Krynicki’s poems.